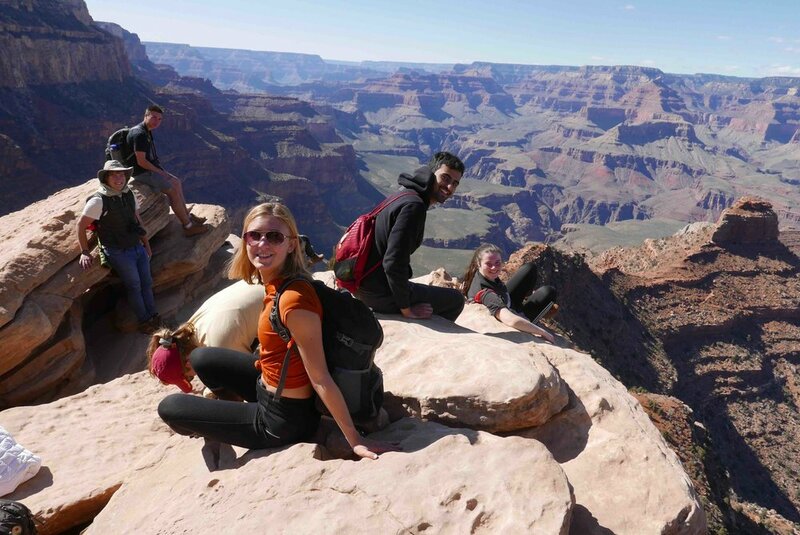 I’m just back from a weekend hiking at the Grand Canyon with a gang of students from USC. They have a hiking club called ‘Peaks and Professors’, and they invite a member of faculty along for each trip, and the point is to have good conversations in inspiring locations, beyond the bounds of campus. Their slogan is ‘Think Outside’ - isn’t that great? This was my second ‘Peaks and Professors’ trip. 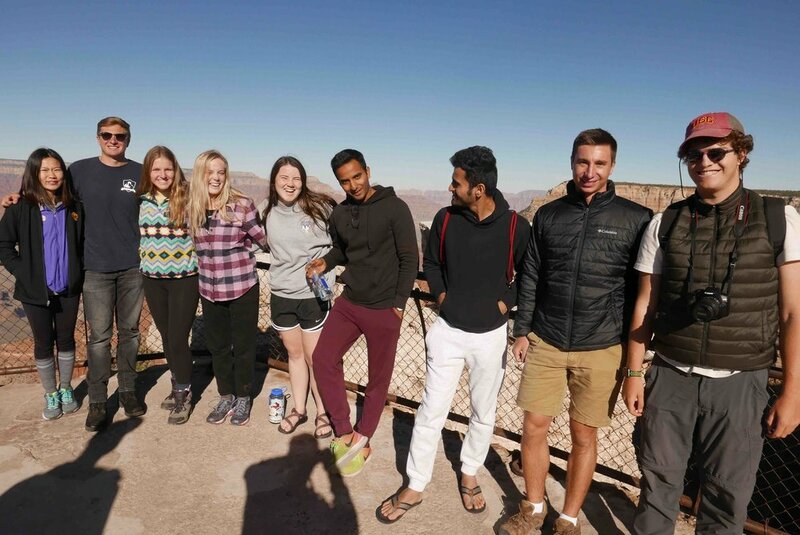 Last semester, I went with a group to Yosemite, and on that occasion several of us read Kerouac’s ‘The Dharma Bums’ in advance of the trip, to bring a ‘bookpacker’ element into the experience. This time I suggested we read ‘Desert Solitaire’, Edward Abbey’s memoir of the seasons he spent in the Canyonlands in the ‘50s and early ‘60s. I first read it six or so years ago, on a road trip through the desert Southwest with my daughter Flo and my son Ollie, and I was keen to read it again. It wasn’t obligatory, but some of the students took up the recommendation, and we discussed the book as we walked. ‘Bookpacking’ Abbey added exponentially to the trip - and sequences from the memoir are rattling round my head as I write this. ‘Desert Solitaire’ is inspiring - but challenging, too. Abbey’s prose is simple, beautiful, electric - but his message is uncompromising. He questions what it takes to ‘do’ nature, to ‘do’ the wilderness. 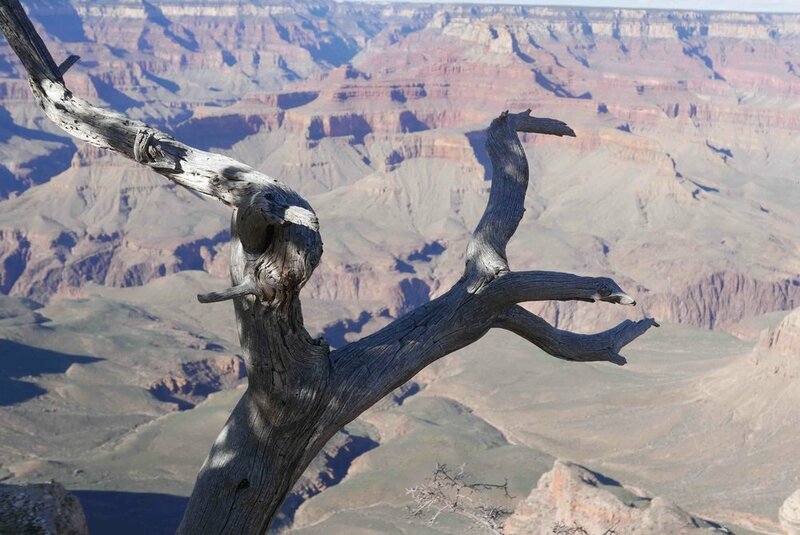 How do we relate to it, as visitors to a National Park like the Grand Canyon? This weekend has forced me to think long and hard about these questions, and I find myself provoked. Edward Abbey has been described as ‘the Thoreau of the West’. His descriptions of the wilderness are simply glorious - deeply knowledgeable, tactile and pure. But like Thoreau, there’s an anger beneath the panegyric. He describes the desert Southwest despoiled through commercial and industrial exploitation - strip mining for minerals and uranium, clear-cutting in the Kaibab National Forest, ‘hooved locusts’ (sheep and cows) on the scrubland, and the wild river, the Colorado, dammed and domesticated to satisfy the thirst and electrical needs of the cities downriver. And from his vantage in the early ‘60s he sees another, imminent threat, which has since become reality: the curse of the ‘industrial tourist’. Like some desert Jeremiah, Abbey rails against the tendency of contemporary Americans to insist that the glories of the natural world be made accessible from the driving seat of a motorcar - and he despairs of the National Parks Service for pandering to these demands. Parts of ‘Desert Solitaire’ read like a polemic, and I stand justifiably reproached, because heaven knows I’ve done enough of this kind of traveling. I’ve checked off National Parks, gas-guzzling my way across the West, delighting in how the miles fall away, everything so convenient, interstates and highways linking us with every fresh scenic delight. In the National Parks you pay an entrance fee and drive on perfect tarmac roads from scenic overlook to scenic overlook. You can drive through Joshua Tree and barely feel the need to step out of the car. Ditto Zion and Arches. And the loop road around the Yosemite Valley is a joy - it’s all there, laid out like a moving tableau, El Capitan and the Bridal Veil Falls, notched up from the comfort of our ‘motorized wheelchairs’. Abbey challenges, stirs, provokes, reproaches. He questions our relationship with the wilderness. He wants us to engage, to connect, to feel. And I was grateful, this weekend, for his uncompromising and forceful presence. Sequences from ‘Desert Solitaire’ accompanied the best and worst of what we saw - the worst, in the industrial tourist hell of the Grand Canyon South Rim Visitor Center. 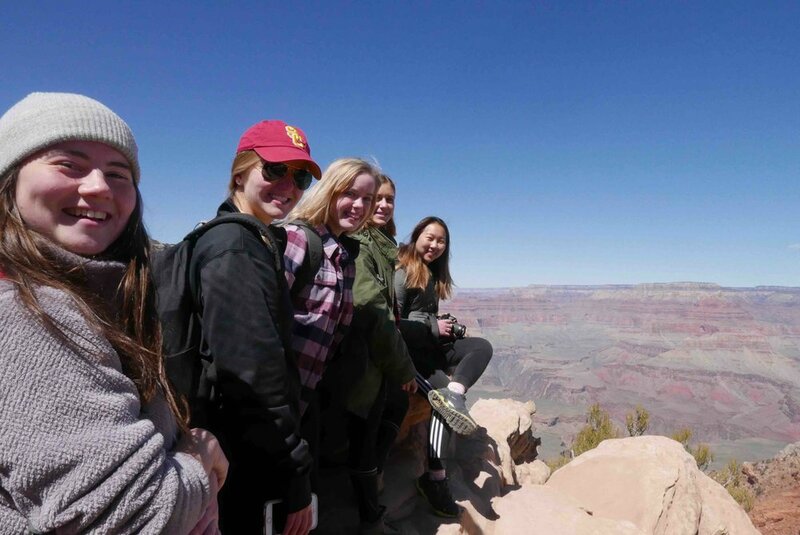 The best, hiking down below the Canyon rim, and spending just enough time in Abbey’s wilderness - that contemplative space which lies ‘beyond the end of the roads’. So. Our trip. Out of LA, five hundred miles on the I-15 and the I-40, lunch at a retro Route 66 diner in Kingman AZ, and by 3pm we’re crossing the Kaibab Plateau and entering Grand Canyon National Park from the south. Extraordinary, isn’t it? - the convenience of this kind of travel. The wilderness is held at bay; our cars have insulated us across 500 miles of dusty landscape. Amazing views, but little sense, yet, of connection. And here at the South Rim that sense of hermetic separation continues. 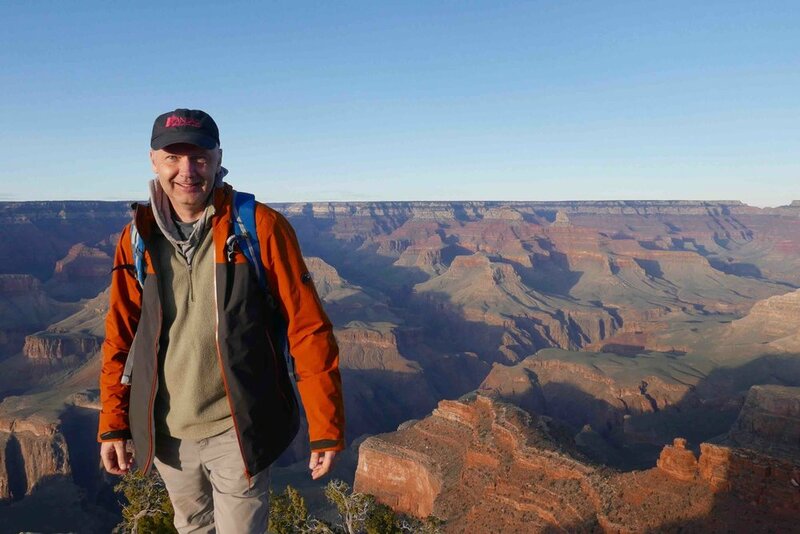 The Grand Canyon is just a two minute stroll from the car park, accessed along tarmac paths. 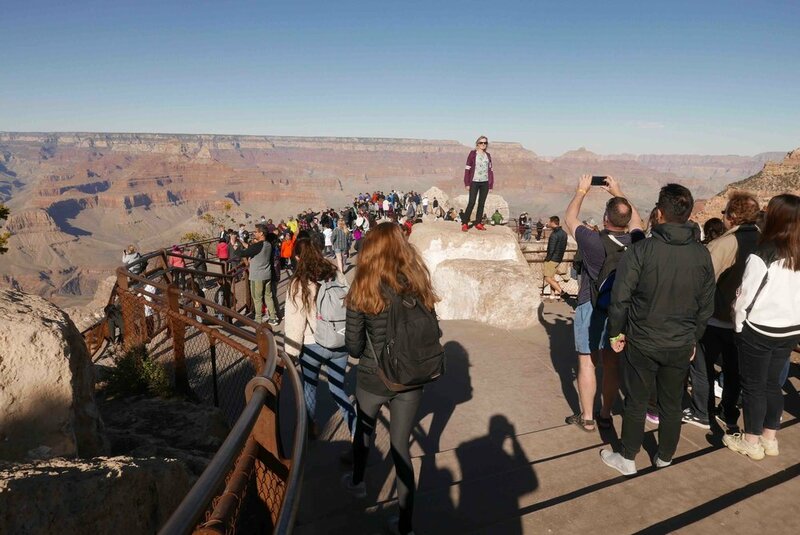 The viewing platforms are fringed with metal barriers, and hundreds of people take photographs, before returning to the Visitor Center to buy stickers and Grand Canyon caps. Six million people come a year; barely ten percent of this number hike within the rim, and only one percent undertakes the two day hike from rim to rim. We’ll be amongst the five percent. We’re aiming tomorrow to do the South Kaibab trail, dropping perhaps 2000 feet into the Canyon, to Cedar Ridge and beyond. It’s barely a fraction of the whole, but it’s something. 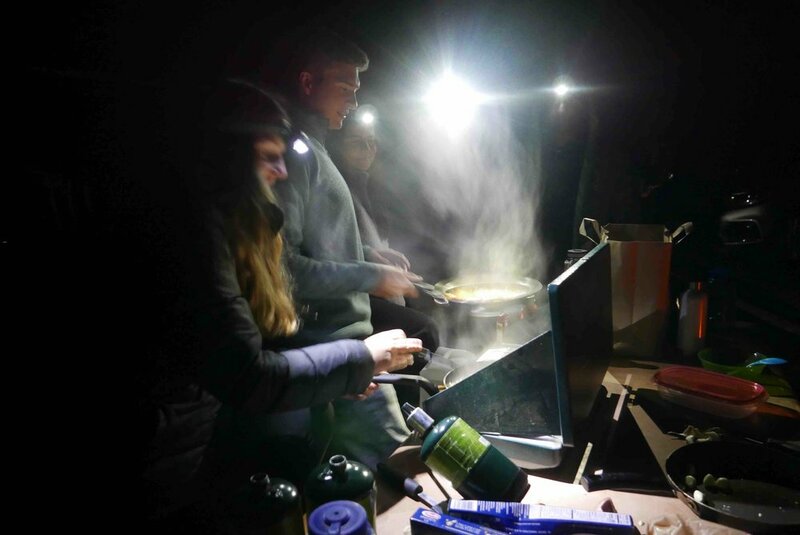 And we’re cooking our own food, and sleeping under canvas, and it’ll be cold tonight, below freezing - surely all that earns us some dispensation, and the great Ed Abbey won’t scorn us too much? (I find myself craving Ed Abbey’s approval - but I fear I’ll be found wanting). Abbey, of course, did things differently. He didn’t visit the National Parks - he hiked the wilderness. There’s a difference. Abbey’s Country - as he himself hubristically calls it, in a moment of joyful connectedness - extends two hundred and fifty miles, a vast swathe of plateau and mesa and butte and canyon, extending from Arches National Park (on the Utah / Colorado border), south west down the Colorado River to the Grand Canyon and beyond. 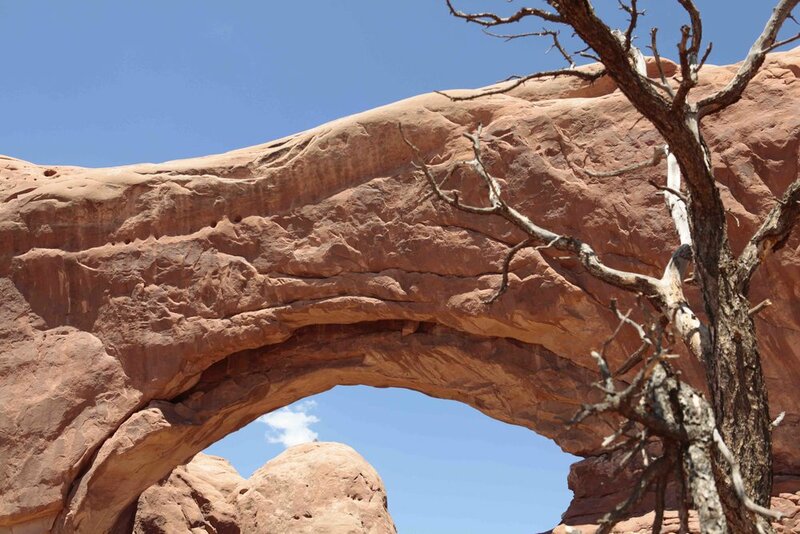 Arches National Park forms the focus of the book. He spent two seasons as a ranger there in the late ‘50s and early ’60s. He lived in a ranger’s hut twenty miles from the Park entrance, going for weeks without company. He did what he could to hold back the development of the park, cheekily uprooting stakes laid out by the surveyors and road builders. There were few tourists in those days, so his time was his own, and he spent it happily on day-hikes into the wilderness, his pockets stuffed with raisins and dried apricots. In ‘Desert Solitaire’ he offers up chapters on snakes, and chapters on birds, and chapters on water, and chapters in which he makes inventories of desert flowers. He seeks for transcendence and cosmic connection, but rarely finds it, acknowledging that he’s earthbound, despite his best intentions. He concludes, ‘I am not atheist but an earthiest. Be true to the earth.’ He’s scientific and good-natured, and an affable guide to this alien, wonderful, mysterious world. The second half of the book takes us further afield. He makes a river trip through Glen Canyon and up the gorge of the Escalante River, in the months before these wondrous regions were flooded with the creation of Lake Powell. He climbs Mt. Tukuhnikivats in the La Sal mountains, and lives for a while with the Supai Indians in Havasu Canyon. He braves The Maze, that terra incognita south of Canyonlands National Park, where no human had been, as far as he knows, since the last Anasazi (‘the old people’) left half a millennium ago. It’s remarkable to think that just sixty years ago, these kinds of virgin experiences were still available to us. But of course that remains the case - and all that holds us back from the wilderness is our own resistance, the counter-pull of comfort and civilization. Go, Abbey implores us. Step into the wilderness, be, ‘think outside’. And so, on Day Two, as planned, we made our way down into into the Canyon from the South Kaibab trailhead. Just a day hike - barely anything, in Abbey’s terms. But a chance, at least, to step (in his words) ‘right inside the mantle of the world’, and to encounter there - what? Stillness, wilderness, time, eternity? Yes - and fun and laughter and companionship. It was a good hike, and satisfying. 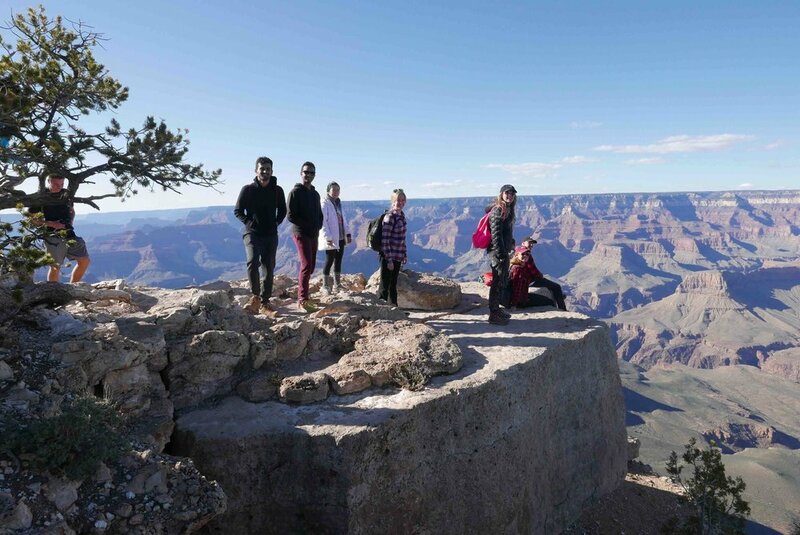 I’d been to the Grand Canyon once before, visiting the North Rim with Flo and Ollie, and on that occasion too we took a hike within the rim for a couple of hours, and we have the inevitable photo of weary-feet-plus-rock-strata to prove it. But seeing the Grand Canyon from the South is different. The light is different; it offers more contrast and definition. The Canyon opens up, its glory becomes apparent. And after a couple of hours descent, beyond Ooh Aah Point, beyond Cedar Ridge, down towards Skeleton Point, the crowds by now thinning out to just a few seasoned hikers, we had time and space enough to absorb the enormity of this experience. Because - the Grand Canyon. My gosh! What an incredible miracle it is. Visually awesome, in its immensity and shifting moods. But also, profoundly humbling - because here is the story of time itself. The strata of the rocks map out the fullness of geological history, from the surface plateau which broke free of the Mesozoic waters 250 million years ago, down six thousand feet to the bedrock within the inner rim, which dates back 1.8 billion years. Almost half the life of our planet, laid out, as readable as a book. And through all this the Colorado River cuts its course, ever deeper, carving out for us a miraculous lesson in geology and human johnny-come-lateness. Like ants, we scurry down these trails, our significant history told over a mere 5000 years, a flicker, a moment, nothing more. Our first pyramids, in Egypt and the Yucatan, triumphs of early human civilizations, mere anthills (to sustain the metaphor) beside this vast geological edifice of negative space. At the end of the trail, a couple of thousand feet down into the Canyon, we sat in contemplation. We watched as the light shifted and lengthened. We felt something of what Abbey describes in ‘Desert Solitaire’, of being in ‘a suspension of time, a continuous present.’ We felt alert in the dry electric air. We made ironic quips that pointed up our human irrelevance (“Where’s the ‘on’ switch?”). We tried (and failed) to resist taking yet another photograph. We chatted and laughed, and fell silent again. 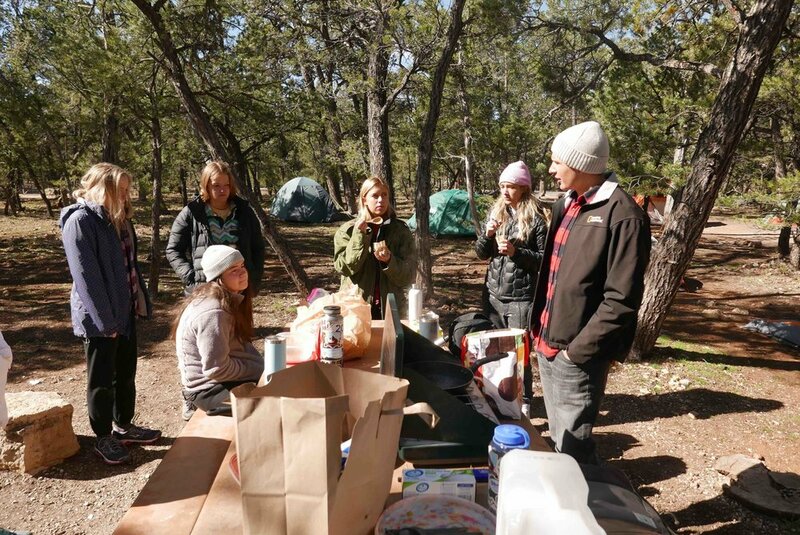 And at last, we mustered our strength for the return journey - and earned through 2000 feet of upward elevation the mac-n-cheese that Tyler, our group leader, was to cook for us later that evening, under the stars, before a second night’s sleep under canvas. We slept exhausted, fulfilled, and happy. Thanks to Tyler, Delaney and Molly for organizing the trip, and to ‘Peaks and Professors’ for this ongoing experience. Sign me up for the next one. PS - inspired by ‘Desert Solitaire’, I’ve just finished reading one of Edward Abbey’s novels, his most famous - an eco-activist caper called ‘The Monkey Wrench Gang’. It’s not a patch on ‘Desert Solitaire’, but it adds an interesting fictional perspective - see here.